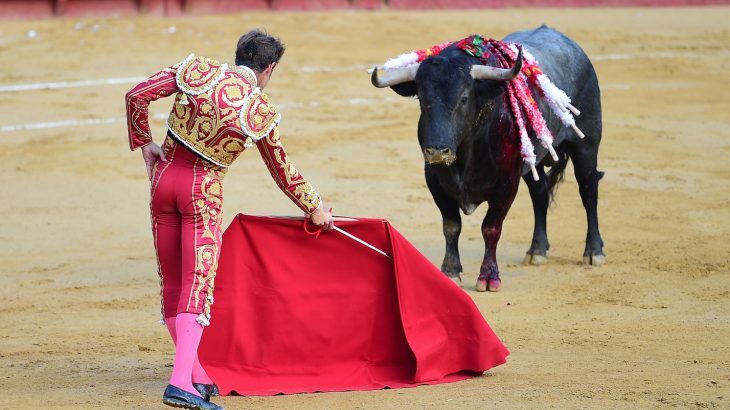 For many people, the country of Spain evokes images of a majestic matador waving a crimson red cape next to a stomping bull. What this scene does not portray is the immense cruelty and pain the bull suffers during the bullfight, ending only when the bull is ultimately slaughtered. While Spanish bullfighting has traditionally been a symbol of local culture and pride, citizens are increasingly rejecting the practice. Bullfighting has a deep history in the country of Spain. The first known bullfight traces as far back at 711 A.D. and was romanticized in the 1900s by Ernest Hemingway who inspired a wave of travelers to watch a bullfight firsthand. Travelers attending a bullfight may come unprepared for the grotesque scene. Images of bullfighting across the U.S. rarely go beyond the waving capes, elegant costumes and stampeding bulls. Contrary to what pop culture portrays, bulls are not agitated by the color red, in fact they are actually color blind to the color. It is believed that the capes are red to hide the vast amount of blood transferring from the bull to the cape. Bullfighting is an inherently violent spectacle. A traditional Spanish bullfight is divided into three parts. In the first part, referred to as “tercio de varas”, a picador who is riding a horse stabs the bull multiple times in the neck. These strikes can cause significant damage to the bull who can lose up to 18% of his blood and lose mobility in his head. In the second part, “tercio de banderillas,” the bull is stabbed in the shoulders with six harpoons. Finally, in “tercio de muerte” the bull is killed. The matador stabs the bull in the chest with a sword, causing profuse bleeding and suffocation while the bull chokes on his own blood. The matador may even cut the ears and tails off the still conscious animal as a trophy. When the bull enters the arena, he is not the violent, aggressive creature spectators expect, but rather a disoriented and scared animal trying to escape. As animal advocacy organizations have worked to expose the realities of bullfighting, local Spaniards have become increasingly disillusioned with the practice. A 2015 Ipsos MORI poll found that only 19% of Spaniards stated they supported bullfighting while two-thirds of respondents said they were not proud to be living in a country where bullfighting is a cultural tradition. In a 2016 study of over 2,500 Spanish citizens, researchers found that the majority of citizens did not like bullfights and the great majority did not attend or watch the events. The results illustrate shifting cultural perceptions of the practice in Spain. Women and young people were concerned with animal welfare while rural people were more likely to support bullfighting than urban people. It’s not just the locals who are distancing themselves from bullfighting. Tourist attendance at bullfights is seeing declines as animal advocacy campaigns gain more traction. In 2008, 89% of British citizens stated they would not visit a bullfight during their holidays. A study on tourists’ ethical attitudes towards animal-based attractions found that tourists rated bullfighting as the least acceptable attraction, placing it above animal racing, rodeos and circuses. Declines in attendance is having an effect on the bullfighting industry. The number of bullfights in Spain declined by 40% in five years. With tourists becoming more aware and young people shifting away from bullfighting, the future is likely to be bleak for the blood sport. Yet, the practice still continues. Regional bans have been passed but to the dismay of many, a ban on bullfighting in Catalonia was overturned in 2016. The judges cited the importance of preserving cultural heritage in their decision. This refrain is commonly used by proponents of bullfighting who see the practice not only as part of their culture but also as an art form. Bullfighting is a difficult political issue in Spain with many politicians still standing strong in supporting the practice. It may be a long time before bullfighting is banned in Spain but changes in tourists’ attitudes towards bullfighting could create significant positive change. Once people learn about the cruelty and violence, the decision to forgo on a bullfight should be easy.